HomeRight is an innovator in the consumer painting industry. They are the originator of the PaintStick in 1986. Today they have a full line of power painting, automotive and home care products. HomeRight wants to help the DIY (do-it-yourself) projects easier, faster, and neater. 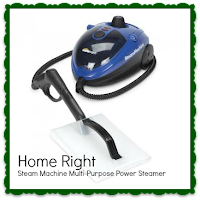 As part of the Holiday Gift Guide I received the HomeRight Steam Machine Multi-purpose Power Steamer. The HomeRight Steam machine Multi-purpose Power Steamer is the fastest and easiest way to remove wallpaper. All you have to do is use the steam plate to apply the steam to the paper and it peels right off. Now I don't have any wallpaper in my house. But the Steam Machine does so much more. It can be used with the attachments to sanitize and clean floors, stove tops, ovens, bathrooms and grills. It leaves behind no chemical residue because it simply uses water and steam to clean. It kills 99% of all germs and bacteria in the process too. The steam mop is perfect to sanitize your hard floor surfaces like the tile, vinyl, and linoleum. High pressurized steam will clean the surface and the cleaning pad wipes it clean. 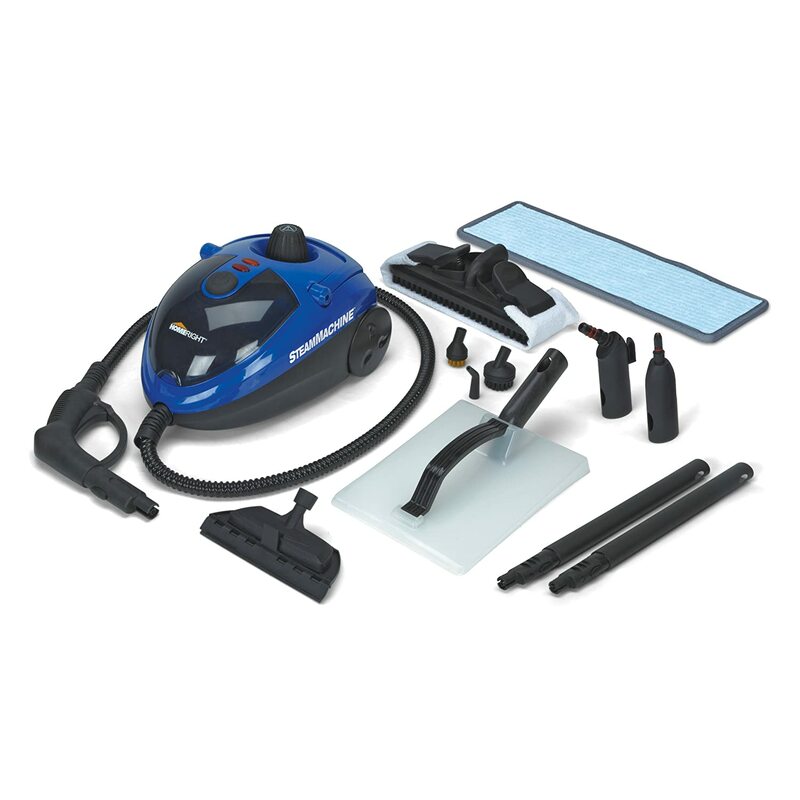 The SteamMachine uses pressurized, high temperature, steam to loosen and dissolve dirt, grease, grime and kill bacteria. The steam machine comes with a a variety of attachments. 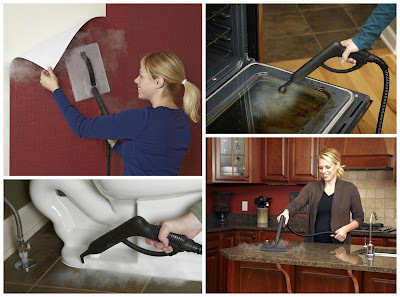 The squeegee attachment that is great for cleaning bathroom shower doors and walls, fireplace doors, and windows. You can even remove the rubber lip and use it for garment steaming and for killing dust mites in mattresses. The Jet nozzle can be used to sanitize bathroom and kitchen fixtures and hard to reach places. 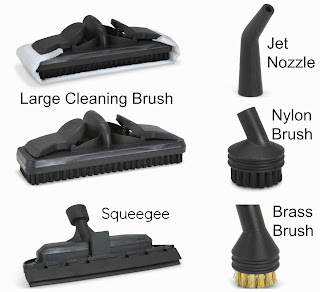 The nylon brush can be used in hard to reach areas around sink and bathroom faucets. Brass brush can be used to remove grease and grime found on grills and ovens. And the large cleaning brush and cleaning cloth can be used to clean marble and granite counter tops and ceramic tile, vinyl and linoleum floors. The steam plate is used to helping to remove wallpaper from the walls. The machine also includes a funnel, a measuring cup and some extension wands. This machine comes with everything you will need to steam clean your home and more. The hose is 8 feet long making it easier to reach. It holds up to 40 oz of water and can deliver steam for up to 45 minutes at a time. It has 2 built in wheels that make it easier to move around, although it is light weight at only 13 pounds, but once you add water it can get heavier. HomeRight has many great products for home improvement. My mom wants to build a deck on the back of her house in the next few months. HomeRight has some great products that would help her in her project. Win it: One (1) Arizona Mama reader will win a HomeRight Steam Machine Multi-purpose Power Steamer. Enter in the Giveaway Tools form below! This giveaway will be open until 1/12 at 11:59PM (MST). Open to US. I would also love the PaintStick EZ-Twist Paint Roller Applicator, how easy would this be?! I liked that the website has project tutorials. I would love to have the airless paint sprayer. Their Deck Washer Broom is a nifty product! I love the paint sprayer. I could really use one of those. I learned that they are Handyman Club of America Recommended! I would also like to try the PaintStick EZ-Twist Paint Roller Applicator. I really want to get the stain stick from HomeRight! I really want the PaintStick EZ-Twist Paint Roller Applicator to paint my ceilings. I like the Airless Paint Sprayer. I love the steam cleaner but I would also love to have one of their airless paint sprayers! I like the StainStick Stain Applicator. That Paint Stick EZ Twist looks amazing! They have a range of great products for steam, glue and paint. entered as Katherine. thank you. I soooo NEED one of these!! Oh I forgot to say that I like their easy paint stick..that is next on my list to paint my ceilings! I would love the deck washer broom for our deck. I would love one of their deck sprayers! I learned that you can remove stickers using a heat gun! I also like their heat pro plus heat gun; these things are the best for removing paint and old caulk. I learned that the steam machine can be used on kitchen counter tops, ovens, stovetops, bathroom fixtures and barbecue grills. Would love to have the HomeRight Medium Duty Paint Sprayer Titanium Series! I would like to try the QuickPainter Pad Edge Painter! I actually own one of their paint sticks, it's great! I would also like to try out their deck washer broom. I like the paint stick! I'd love the PaintStick EZ-Twist Paint Roller Applicator too! I really like the PaintStick EZ-Twist Paint Roller Applicator. I just wonder how hard it would be to clean out. I could really use the paint sprayer and this steamer! I like the Pro Electric Paint Roller! My favorite item from the Holiday Gift Guide is the Brylane Home Bread Maker! I love the StainStick Stain Applicator this would really come in handy in my house! The paint stick would be extremely helpful to me. I like the Deck Washer Broom. I like the PaintStick Paint Applicator. I learned I can use the pressurized, high temperature steam to clean my grill! I hate cleaning the grill! I think the paint stick is great! Yes! the HomeRight Steam machine Multi-purpose Power Steamer is the fastest and easiest way to remove wallpaper. Thanks for sharing this wonderful tips.